Florida State didn’t get the Seminole name until 1947, but it took longer for Chief Osceola to make his appearance. Originally the brainchild of then sophomore Bill Durham, Chief Osceola and Renegade did not make their debut until 1977. It took head coach Bobby Bowden’s influence and sensitive ear to push Durham’s fight through. It was a fight that lasted since 1962. 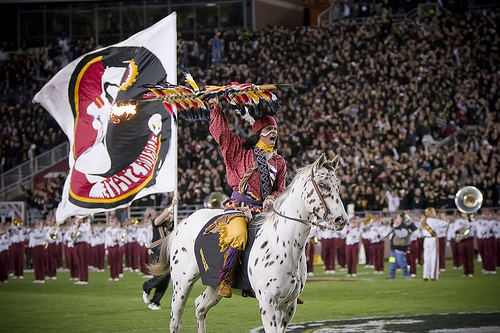 In 1978, Chief Osceola and his horse Renegade, who first was donated by a local vet, took the field against Oklahoma State University. Sometimes mascots make light of some sensitive subjects and ethnic derived mascots are one of those subjects. Strangely enough, Florida State is one of the schools that do a great job of working with the respective ethnic group to ensure the proper tribute to their tradition. Bill Durham sought out the approval of the Seminole tribe before pushing his mascot duo idea. The university takes the Seminole Tribe of Florida very seriously and wants to continue their tradition as well and sending out the message of the Seminole. The official garb of Chief Osceola had the help of authentic Seminole women. Small touches like that ensure the tradition will continue. Let’s talk about the costume. The help of the Seminole women show in every thread. There isn’t a big goofy head or some characterized Indian wearing a fuzzy outfit. This is some guy dressed in sharp Seminole thread. Authentic thread. 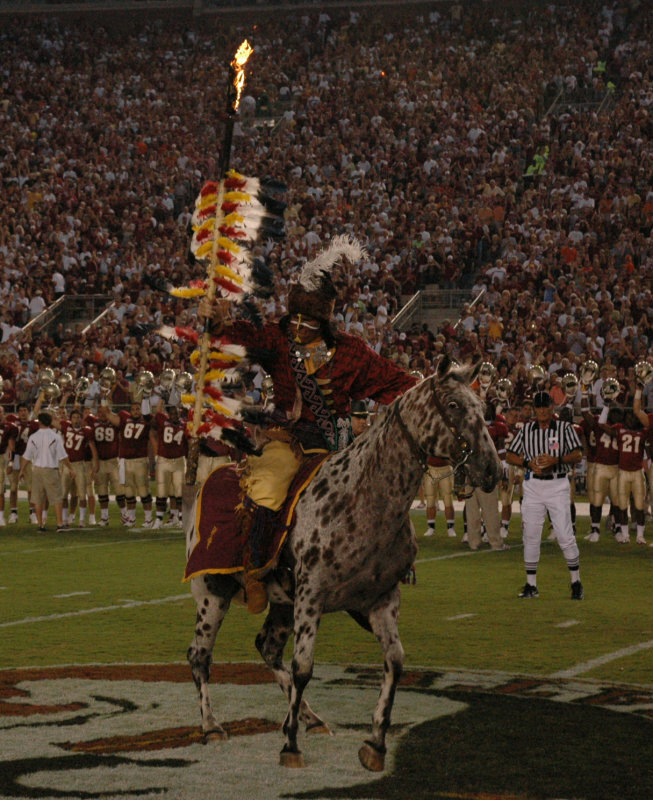 Chief Osceola trots onto the field with his trusty steed, Renegade. There isn’t much information there. It seems Renegade gets a swanky dress that flops around his back to make him look like a tough cookie. We like to think its the icing to Chief Osceola’s cake. The candle of this cake has to be the humongous spear he totes. 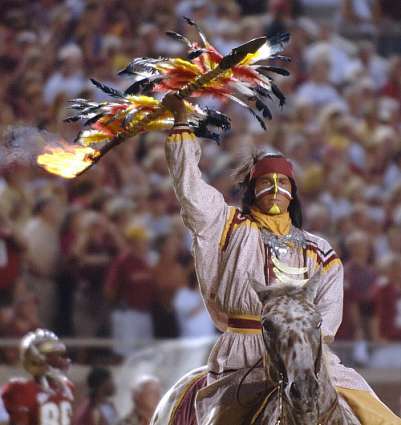 One of the great traditions in football is when Chief Osceola takes a flaming version of the spear and stabs the middle of the field. Very few mascots celebrate a tradition outside of the school. Some universities do so with local legends, while others tackle grander mythic warriors. The Florida State Seminoles and Chief Osceola (with Renegade) celebrate a real warrior tradition with the Seminole Tribe of Florida. Not without its detractors, these mascots do more to bring attention to a ethnicity and society long forgotten. Does the Chief have to ultimate mascot pizzaz? Nope. But he looks like he means business if a fight was ever for sale. DAMN!